You want to know what the biggest a-ha moment was during my recovery from binge eating nearly a decade ago? My out-of-control eating wasn't actually the problem. It was actually only the symptom. Want to know what the problem was? So, what is restriction? It can be a lot of different things. Judging foods as good or bad, and beating myself up when I ate "bad" foods. That was restriction. Tracking macros in MyFitnessPal. That was restriction. Doing a "cleanse" for "health." That was restriction. Embracing the next shiny "healthy lifestyle change." All of these restrictions lead to out-of-control eating. Take a moment and check yourself. How are you restricting your eating? Hit reply and tell me the different ways that you currently restrict your eating. Now, I can hear you saying, "But if I don't restrict myself, I will just go crazy and eat everything in the world. I hear you. But here is the truth. Restricting and out-of-control eating are just different sides of the same coin. So many people before you have learned how to stop restricting and have seen their urge to binge just drop away. Just imagine what it would feel like if you were able to stop the out-of-control eating and not have to restrict yourself. Where you are able to enjoy food, but not obsess about it. Where you eat food that feels good in your body, and then you just move on with your day. Where you focus all that mental energy that used to be on food onto whatever bad*ss creations that were once only in your wildest dreams. I want to see what you are going to create when you have healed your struggles with food. You've got this. Keep learning. Stay in touch. And put on your crown. Hi, my name is Natalie. I'm a recovering perfectionist. Are you a member of Perfectionist Anonymous? I know that when I was struggling with binge eating every single day for over a decade that all I wanted to do was to do it right, to be perfect and to not keep messing up all the time. I would try really hard to seek that perfection, to be good. And ultimately, what would happen is it would swing the other way and I'd end up stuck in these behaviors that left me feeling out of control and crazy. What I've learned through my journey of recovery is that it's absolutely essential to let go of the perfectionism and instead, to seek presence. When we're actually present with what's happening in the present moment, then we can notice the thought patterns that lead us towards those actions of out of control eating. But when we're stuck in that perfectionistic mindset, then we are always seeking something forward in the future. We're not here now. When we're in that seeking mindset, we aren't aware enough to notice those classic old thoughts that lead to those classic old actions. If you want to let go of your out of control eating habits once and for all, then I want to support you to seek presence, not perfection. Today for your Tiny Action, when you notice yourself going off into that perfectionistic "someday I'm going to get it right. I'm going to be perfect. I'm going to do all these things to get there." I want you to instead take a deep breath, feel your body pressing down against the ground, be here in this present moment through the sensation in your body, and seek presence, not perfection. If that sounds good but you don't really know what I'm talking or how to get to that place of presence, then the Goodbye Binge Eating Foundation's course is the place for you to start. You're lucky because it's about to start but it hasn't yet and you can still join us as Founding Member. Founding Members are going to get to participate with me LIVE and get an awesome one-time-only introductory price. If you're interested in finding out more about the five essential first steps you must take to build that foundation to say goodbye to binge eating once and for all, head on over to natalieforsythe.com/newclass right now so that you can secure your spot. People who are struggling with out of control eating usually end up eating really quickly, standing in the pantry when no one's watching. Or classically, in front of the TV, mindlessly eating that whole family size bag of chips and not even realizing you're done until you're done. Instead of getting stuck in those mindless cycles of eating, what I want to do is give you permission to savor sensation. It's okay to enjoy eating. It's okay to feel good feelings through the sensations in your body. In fact, when you choose to focus your mind on pleasurable sensation, you're able to have a richer experience of life. When you are eating, I am suggesting that you pay close attention to what it looks like and smells like, the textures, the taste— to savor those sensations. There is actually a part of our digestive process that gets stimulated through sight and smell, and if we neglect those sensations— if we're mindlessly eating— then that digestion aspect never gets stimulated and we don't feel full. So we end up eating a lot more, and don’t even notice it. Another really important reason to savor sensation is that when you actually focus on savoring the sensation of your eating, then you actually get that deep satisfaction that you want from the food. It's okay for you to feel pleasure. And I want to support you to experience it in your eating, as well as in the other aspects of your life. Feel the pleasure of putting lotion on your skin. Feel the pleasure of the sun soaking into you. Feel the pleasure of being able to look at beautiful things. It's okay to feel good. When you savor sensation, the world gets a lot brighter. If you want to learn more tools to help you say goodbye to binge eating, then I want to welcome you into an exciting new class. It's the Goodbye Binge Eating Foundations course. You will learn the five essential steps to build the foundation, to say goodbye to binge eating and emotional eating once and for all. I'm opening this class up to the very first cohort of founding members super soon. When I do that, the people who sign up as Founding Members are going to get a couple of really cool things. They're going to get to experience the class with me LIVE, which in the future it's going to be a recorded home study course. AND you're going to get an awesome introductory price. If you want to get in on that, head on over to natalieforsythe.com/newclass and save your seat on that wait list. That way you will be the first to hear about it, and you can be one of those lucky Founding Members of Goodbye Binge Eating. A quote that has been so important on my own journey of having recovered from being stuck in the cycles of bulimia for over a decade, was this one: "pain is inevitable, suffering is optional." The intense moments of pain are going to happen. The people we love are going to get sick, we will get laid off, these things are part of what it is to be human. What we have choice around is how we then react to that initial moment of pain. Today I want to talk about a very specific part of how we react, and teach you what I think is one of the most powerful tools on the path to food freedom, and that is acceptance. We need to accept what is. If we're in resistance to what actually has happened, then we are creating more suffering for ourselves. If we are arguing with ourselves in our mind over something that has already happened by imagining how we could do a past scenario differently, we're creating more suffering for ourselves with those thought patterns. Instead, I offer you this very powerful phrase that you can say to yourself when you notice yourself stuck in those mental head trips of "if only I had," "if only it hadn't happened." That magical phrase: it is as it is. I accept that it is as it is. This is what is happening, so instead of creating more suffering for myself through my resistance to what is true, I am instead going to just accept that it is as it is. In finding that acceptance, you eliminate that suffering for yourself. The less suffering we're experiencing, the more able we are to actually show up in choice about how we're eating, and to not numb out our emotions and painful though patterns with food. Over and over again, each time you notice those suffering thought patterns, say to yourself, "it is as it is." PS From Food Freedom Land! If you want to learn more amazing essential mindset shifts, and actionable tools then you want to know about the Goodbye Binge Eating Foundations Course. It is going to be the five essential first steps that you must take to build the foundation for yourself to finally get over binge eating and emotional eating, once and for all. I have an exciting opportunity for Founding Members to join this class. Founding Members will be able to actually participate in these classes with me, live. In the future they'll be recorded. AND Founding Members are going to get an awesome introductory price. If you're sick and tired of the food crazies, then my guess is that you want to figure out how to control your eating so that you don’t go crazy yourself. You're ready to be done with the bingeing, done with the emotional eating, and ready to feel like you actually don't obsess about food all the time. They think: "I'm going to control my eating so that I can push through this resistance that I have to changing myself, the resistance to being the best version of myself." And what I find is that when people try to push through that resistance, it doesn't work. They're using willpower, they're using this artificial energy that ends up busting and you don't end up where you want. What happens when willpower busts out on a diet? You end up swinging way the other direction and eating everything in the house. It happens like clockwork, guaranteed. So instead of pushing through the resistance to change, I want to offer an essential mindset shift: rest through the resistance. Give yourself the permission to chill out. The reality is is that we are all super overwhelmed and stressed out these days. The phone is always blinging, the boss is always calling, the kids are always yelling. There's always a lot going on. When we are stuck in so much stress from the intensity of life all the time, the last thing that we need is try to push through the resistance of our food behaviors to try to control them. If we want to actually create sustainable change, the answer is to instead of pushing through that resistance, to rest through the resistance. What I mean by that: go take a bath. Go take a walk. Go do something nice for yourself. Put on some music and just lie down. Rest through it. By giving yourself the ability to rest you can then, from a nurtured and nourished place, show up and start to make different choices about the way you're eating. I am dedicated to continuing to teach you more tiny actions to help you live the life that you've actually been so hungry for all along. I want to tell you about something really cool that's happening in the Food Freedom world: the Goodbye Binge Eating Foundations course. It's going to teach the five essential steps to build the foundation to say goodbye to binge eating once and for all. I am taking the most powerful tools from my highly successful (people stop bingeing left and right) 6 month long Path to Food Freedom program and giving them to you in just 6 weeks! I'm opening this class up to Founding Members who are going to get a couple really cool things. For one, they're going to get to participate in the class with me live, and the second thing is that they are going to get a great introductory price that will only be around for this very first time through. So if you want to be able to be one of those Founding Members, head on over to natalieforsythe.com/newclass and you'll be able to get on the wait list so that you can sign up first thing and be a founding member of Goodbye Binge Eating. Do you desperately want to change your out of control eating patterns? Are you so ready to finally figure this food struggle out? I bet that you feel like you can't trust yourself because you failed at so many of the other things that you've tried in the past. That at this point, there is little will in you to do something new and to try something else. Showing up and making a big change in your own life requires conjuring up the tenacity to change from somewhere deep inside. It’s time to find the source of your tenacity. It takes getting in touch with the deep desire to change (from a loving and caring place) to get in touch with that tenacity that helps you to push through that first couple layers of resistance so that you can actually start to behave in new ways that are supportive. Now, I'm not talking about using willpower to stay on a diet. I'm not talking about using willpower to do that exercise routine that's actually killing you. I'm talking about conjuring up a deep tenacity from inside of yourself to take care of yourself, to make one tiny action after another, to move more and more into self acceptance and into empowered choice so that you can create the life that you've actually been so hungry for. Where does that tenacity come from? We have to focus on our hearts’ deepest desires to find that tenacity. Find it and gnash it. Gnash your tenacity! Sometime we have to call on something outside of ourselves: call on that wolf howling at the moon, or you think about someone who's been through something so much more intense than what you're going through— maybe someone experiencing war time or working with a disability. Persevere! Think about those people. Feel into it, and gnash your tenacity. Let that tenacity build up inside yourself and take that next step. It's not always going to be easy, but once we start taking steps, once we start the motivation, we can be the snowball rolling down the hill. But the essential thing therein is that you're not doing it from a place of restriction and push, but from a place of tenacity, from a place of, "I am going to do this for my life. I am going to take a stand. I am going to do what I need to do, so that I can figure out how to live this life that I have actually been so hungry for all along." I have a new class coming out super soon called Goodbye Binge Eating, and it is the six essential foundational steps that you must take to say goodbye to binge eating forever, and say hello to Food Freedom. If you want to be one of the Founding Members, then I want you to head on over to natalieforsythe.com/newclass. Signing up on this list is going to put you on a wait list so you get the opportunity to get one of the first spots available. The Founding Members are going to get a couple really cool things: They are going to get to participate in this three month program with me LIVE, and ask me lots of questions and get a lot more interaction with me, and two, you're going to get a special Founding Member price that's only going to be available to the folks who join first thing. Emotions. Emotions. Emotions. How overwhelming emotions can be. My guess, if you are reading this blog, is that when you feel intense emotions, you stuff it down with food. You use food to make yourself feel better. You use food to feel just a little bit more comfortable, and you use food to numb out from those intense emotions. Am I right? I want to offer another tool to help you in one of those moments where you experience a lot of intense emotional duress. Give it to the earth. What does that mean? Give it to the earth. Here’s how it goes: you experience a moment of intense emotion, go outside, if you can be barefoot. You might be standing, you could even be down on your hands and knees, you can be however you really want to be, but the idea is that you're in contact with the ground. Take a deep breath in and as you exhale, you do a big releasing breath that is audible. Then as you release with that vocal exhale, you also envision sending that emotion into the earth. You just send it out of your body and into the earth. Now, this might sound a little funny, and in some ways it is, but what if it helps? What if you could to that instead of binge? I know, anecdotally from my experience and the experience of so many students of mine, that doing this kind of exercise can take you from being in a place where you feel right on that edge of out of control eating, to a place where you actually are feeling more calm, and grounded, and able to move through your day without going to food. Just remember: get in contact with the ground, envision sending out the emotion into the earth and exhale vocally as you do it. May you experience this powerful release when you give it to the earth. Do you feel like you just don't have enough willpower to control your emotional eating and your binge eating? That's what everyone say it's, "Just don't do it! Use your willpower! Make it through!" But the reality is that when we behave in that kind of willful way, where we're really exerting so much energy to control our actions, inevitably that willpower will break, and we're gonna swing the other direction to out-of-control eating behaviors that make us feel crazy. So instead, I want to offer a perspective shift on willpower. Willpower isn't the solution, it's actually the problem with your eating behaviors. That process of trying to control will inevitably always backfire. Instead of being willful, may you be willing. May you be willing to learn new tools. May you be willing to make different choices. May you be willing to get the support that you need to actually figure this food thing out once and for all. Today for your tiny action, I want to offer you this simple phrase that you can say to yourself in your mind, when you notice yourself going into that willpower place. And that is: "I'm willing to to make a different choice right now." I am willing to make a different choice right now. May you find your willingness and let go of that willfullness. Self love. Self love. Self love. How many times have you heard people talk about self love? And you think: "uh, yeah, looking in the mirror and saying 'I love you' is not gonna do it for me." I know that people struggling with out-of-control eating issues look at that concept of self love, and think "how could I possibly love myself? I'm doing all these behaviors that show how much I don't care about myself, that show how awful I am." I don't think you're awful. I just think you're stuck in behavioral patterning, but I know the thinking, because I have been there myself. Going from a place of self hatred to self love is not easy. There are some stops to make along the way before you can get to self love. One of the most powerful ones that I know is acceptance. Acceptance. What does that really mean? It is super understandable to think: "how can I possibly accept these crazy behaviors? How can I accept that it's okay to be binging in this way?" I want to give you a mental shift on the concept of acceptance: acceptance does not equal approval. You can accept something without approving of it. If you aren't in acceptance of something that has already happened, then it is something that you can't change. So if you aren’t accepting the truth of it, then you're creating more suffering for yourself by being in resistance to it. You create more suffering by beating yourself up about it, and being in the guilt and shame cycle about it. Instead, what I wanna support you to do, is to shift your focus from being in resistance to what already has happened, to being in acceptance of it. Accept the fact that you binged. Accept the fact that your body is how it is right now. It doesn't mean it won't ever change, it just means that you're accepting what is, in this moment. If you're not accepting what is in this moment, then you're just creating more suffering for yourself. For your tiny action for today: the next time you notice yourself in the mental cycle of, "oh my God, I can't believe that my thighs look like this," or, "oh my God, I'm just so awful that I ate all that food." That instead, you take a moment, and you say, "well, it is as it is." It doesn't mean you're approving of the fact that you look the way you do, or that you behaved the way you behaved, but it is at least accepting that it is. That is an important step on the journey to self love, and the journey to letting go of these behaviors that are driving you so crazy. Just remember: Acceptance does not equal approval. If you are struggling with out of control eating issues, then my guess is that you are living in a black and white reality, where things are either good or bad. You had great success or you were awful. You feel excellent or you're judging yourself and you feel really guilty. Where you are dieting and restricting, or where you are off the deep end, eating everything in the house. Well if that's you, then I can guarantee that you want to get off the pendulum swing. It is not fun to be swinging between those two extremes. I bet you want to learn how to live in the gray. An essential component of being able to live in the gray is being able to accept exactly where you are and that you simultaneously want to change. In order to get to a place where you're not bingeing all the time, you need to accept that you are bingeing. While you want to stop bingeing, and you want to feel like you have choice over what you're eating, the way to do that is not to restrict. It's to accept that you're bingeing, and then to simultaneously hold the commitment to not binge. Now you might be saying "how can I accept something and also commit to not doing it? That is totally paradoxical." Bing ding ding. You are right, it is an incredible paradox. Something that I have learned is that in order to learn how to live in the gray, we have to learn how to be at peace with paradoxes of life. They are all around us all the the time. While they might seem mutually exclusive and they can't happen simultaneously, it's the only way it's going to happen. The only way you're gonna stop bingeing is to accept that you are, and to commit that you don't want to. You might feel like acceptance is just letting it all go and surrendering. I want to tell you differently. It's the key component to getting to that place where you stop. There are so many other paradoxes that exist throughout your life. 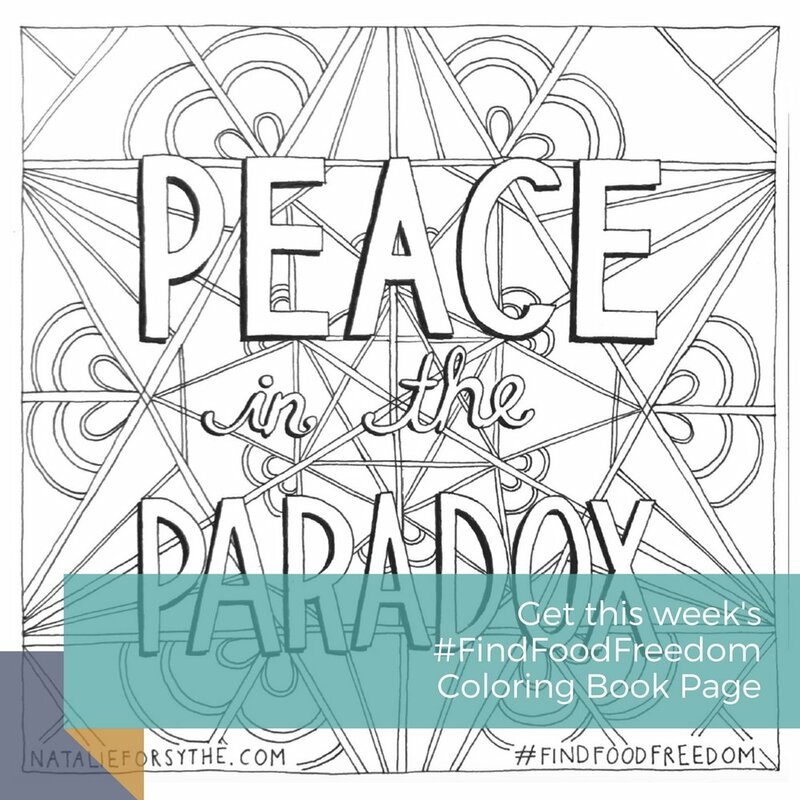 Instead of being driven crazy by the paradoxes and trying to put them either in the good or bad camp, that you can remember the gray and instead choose to be at peace in the paradox. Let me guess. You have a confusing relationship with commitment because you've tried so hard in the past to commit to this diet and to that diet, and you've ended up failing at all of them. You feel like a failure, and that nothing's going to work for you, so why commit at all? I understand. You are not alone. I used to struggle with that myself. I want to reframe commitment. Don’t commit to a diet. Don’t commit to a new way of eating. Commit to yourself and to the life that you want to be living. Commit to learning what you need to learn in order to get over the food crazies and start to have a relationship with food and with your body that feels easeful. It might sound impossible, but I promise it is possible with the right teachings and with the right mindset. Commit to the journey. Commit to the life-long journey that it is to live in a body. Commit to the life-long journey that it is to understand how to eat in a way that leaves you feeling at ease instead of out of control. I guarantee it, in this commitment, you will stumble along the way, you will fall, you will trip up, and that that is all part of it. That is where you get to learn how to grow and change even more. Today for your tiny action, I want you to understand what it is that you want your life to be like in that life-long journey. Not about what size you want to be or what food you want to eat, or any of those things. But what you want to experience on the life-long journey of living the way you want to live. Commit to it, and then realize that all you have to do is take just the next step. You're not trying to get to the end of the journey, you're just trying to keep taking your next step and your next one and your next one along the path. TinyActionTV Episode #23: What Are You Actually Hungry For? All the time I talk to people who go to food for that moment of instant gratification even though they're actually trying to fill up a deeper hunger inside themselves. They try to fill that deeper hunger with food but it never works, and it actually ends up making them feel worse. What I want to offer today for your tiny action is to ask yourself the question: What actually fills you up? What is it that is that deep hunger in your soul, in your mind, and in your heart that you want to fulfill? What's that big dream? What's that way of connecting to others, what's that way of being in this world that would actually fill you up in a much more gratifying way than that food ever could? I hope that asking yourself this question will start to give you a step forward towards that deeply fulfilling life. And remember, we're all about Tiny Actions in the Food Freedom world. . Even though it might be a big dream, just think about one small way that you could bring a tiny bit more of that kind of experience into your life today. Build onto that tiny action over time, to create the truly fulfilling life of your dreams. Are you ready for one of the most powerful teachings I have ever found? Emotions only last 90 seconds. You heard me right. There is actually a neurological surge of chemicals that courses through your body when you have an intense emotional trigger and reaction. That surge of chemicals passes within 90 seconds. If you are still experiencing the emotion after 90 seconds, it's because you're attaching your thoughts to that initial experience of the emotion, and you're extending it with your thought patterns. Your tiny action for today is to take that moment when you have an intense emotional trigger, and remove yourself from the situation and breathe. 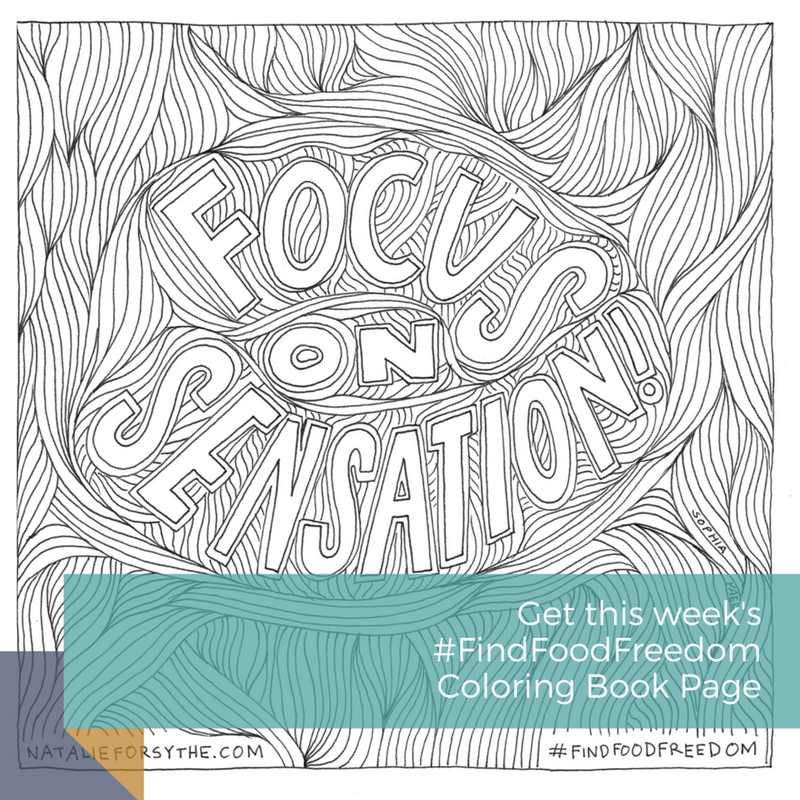 Breathe and try to focus all of your mental energy that you can on the sensation in your body. Feel the physical sensations of that surge of chemicals moving through your body. Name out loud the sensations you are feeling as they change. If you can focus on the sensation of the emotion, instead of on the emotional story, then you can experience that your emotions only last 90 seconds. When you get good at this, you can keep yourself from going deep into a binge whenever you experience emotional upset. Instead you can feel what you are feeling, and let it move through and not eat about it. This has changed my life and so many others’ lives, as well. I hope it deeply impacts yours. Your emotions only last 90 seconds. Talk about freedom. Do you feel like you're living your life on a hamster wheel of your thoughts and you're constantly thinking about what happened in the past and feeling bad about it, or worrying about what's gonna happen in the future and you're just on the hamster wheel of your thoughts? You are so not alone. Basically, everyone who I support who's struggling with out-of-control eating issues have this kind of relationship with their thought patterns where their whole life is happening inside their head. The way to get out of the out-of-control eating patterns and to get out of your head is to focus on the sensation in your body. The next time you notice yourself racing on the hamster wheel, what I want you to do is to take a moment and to focus all of the mental energy that you can, that would normally be racing, and to focus it in on what you can feel inside your body right now. Find a physical sensation to focus on. Maybe it's your ribcage expanding. Maybe it's how your weight feels pressing down against the ground. Maybe it's the hair on the back of your neck rubbing slightly. Whatever it is, just focus your mind on that sensation and take a couple of deep breaths. In the moment when you are about to eat in a way that feels out of control, take a moment and focus on sensation. With time, this practice can add up to getting you out of your mind into your body, and into a place where you're actually able to make the choices that you want for your life, for your health, and for your sanity. If you've been around TinyActionTV for a while, then you know one of my favorite things to say is, "you are never in control but you are always in choice." How many times have you said, "if only I could just control my eating, then everything would be okay?" But it's that trying to control that ends up backfiring that has you eating all the chips in the store. So, that is why developing your capacity to be in choice is one of the key aspects to getting through out of control eating patterns. I have a whole big framework ofEmpowered Choice that I like to teach, but today I'm gonna offer you just a tiny and powerful part. Value-driven choices. Make choices that are driven from your values. Ask yourself the powerful questions about your values. How do you want to feel? What do you really care about? Make your food choices informed by these answers. For example: I choose to honor my value of pleasure, and to revel in eating this piece of cheesecake. Or, I choose to value my honor of health, and choosing a food that I know is going to give me sustained energy and feel good in my body. When you can harness your values, it can make it much more easy to make choices, instead of trying to control what you're eating and having it back fire on you. . So for your tiny action today, I want you to ask yourself this question: What value do I want to honor with this food choice? When you're really struggling, getting through it and into a balanced, healthy place can feel insurmountable. I completely understand. When I was struggling with my crazy, out of control eating patterns, which let me tell you, were super crazy. In the course of one day I would go from restricting, heavy restricting dieting, to out of control binging and ultimately purging, too. It was excruciating. There was a part of me that thought, “This can never change. There is no way that I can ever get through this." Something happened to me one day which shifted my perspective. I came to the recognition that I was going to commit to the journey and to keep taking the next step, with the recognition that this wasn't something that I was gonna fix all at once. It wasn't going to be this magical moment where I now eat heathfully with ease and I feel totally relaxed around food. That kind of epiphany wasn't gonna be the thing that got me there. But what was, was continuing to take just the next step. I sought support, I found a therapist. She was nice, she didn't really have tools for me. I found a nutritionist. He led me further down the path to disordered eating. But I didn't let any of those steps foil me and not continue forward with my commitment to find this food freedom thing for myself. As I kept taking steps, momentum kept building. One of the most important things about a step is that it's small. If you've been hanging out for a while, you know that this is TinyActionTV and I am all about those tiny actions, those very small behavioral changes that you can start to make to keep walking along that path to Food Freedom. So my Tiny Action for you today is just feel into what is that next small action that you can take to get you further along your path, with the recognition that there is going to be boulders right in front of you, you're gonna have to walk around them. Things aren't gonna go perfectly. And you aren't going to be able to execute everything that you want and get it all done now. 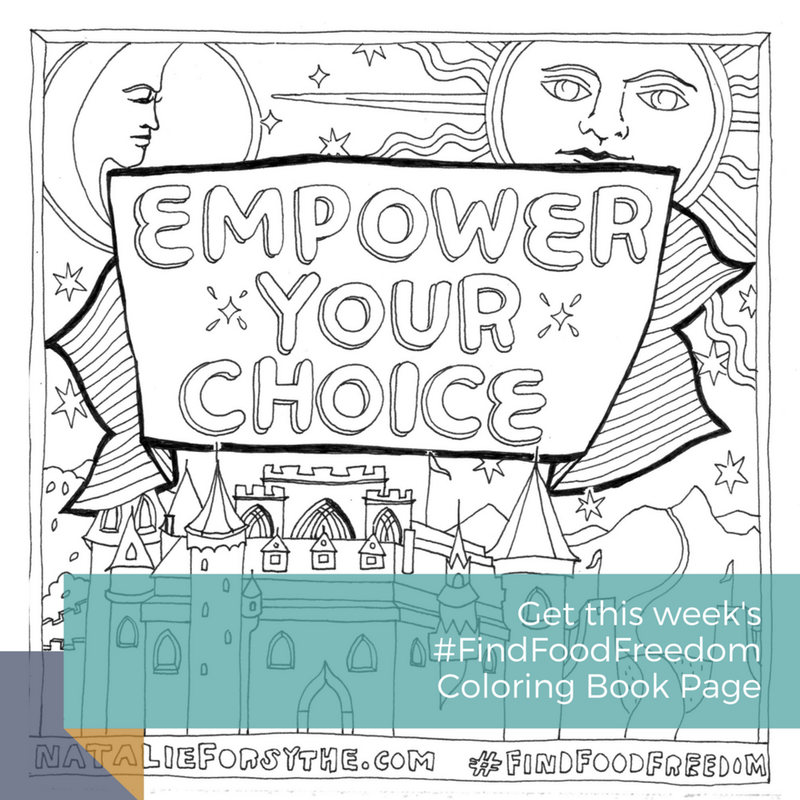 Today’s coloring book page is a beautiful one. 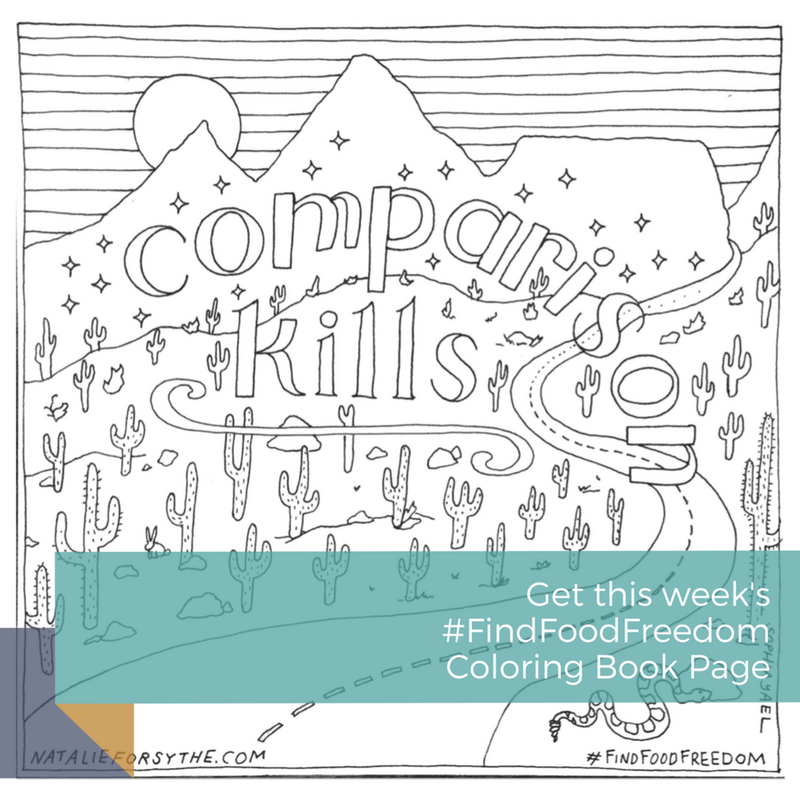 Printing it out and coloring it in could be your Next Step in your food freedom journey. If not that, then think about focusing on meeting your core physical needs: drinking one glass of water, go to sleep 5 minutes earlier, roll out your yoga mat and stand on it. Just take that next step. And feel the momentum build.